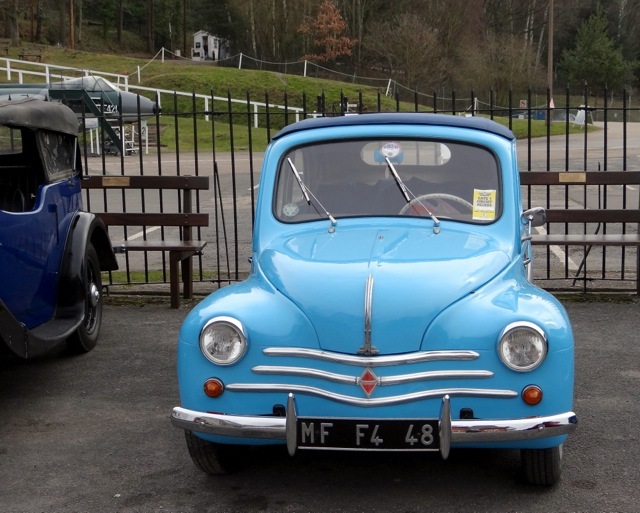 Today Mario’s ‘brother’ Regie, a 1958 Renault 4cv Convertible was invited for a day out as part of the Brooklands Double Twelve Press Day. 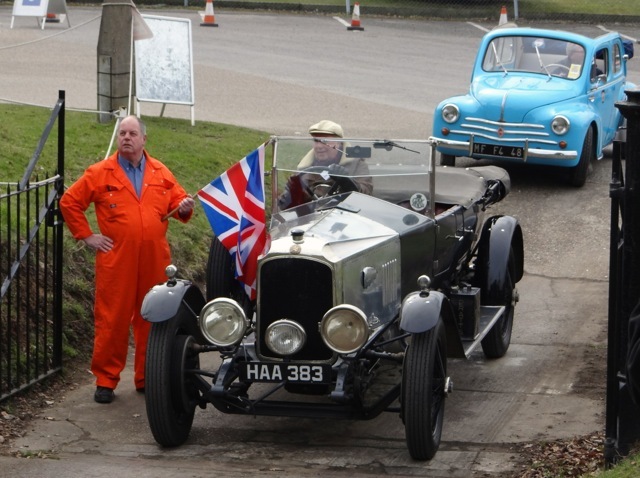 Regular readers will remember that Mario had a great day at the Double Twelve event last June. 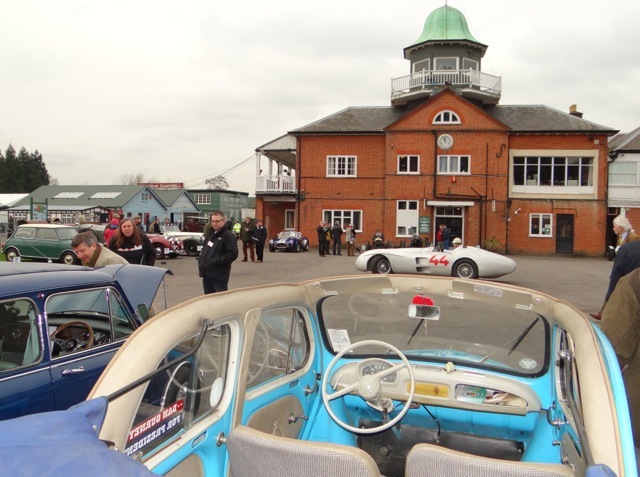 The event is one of Brooklands biggest weekends of the year and a good selection of cars was invited to be on display around the club house and take journalists on a couple of sample tests and to have a go at judging a concours to give them a taster of what was going to be happening in June. The weather was fairly kind to us, quite bright and not quite as cold as it has been and really rather pleasant as long as one was wrapped up warmly, Regie isn’t really the best car for this time of year being convertible and having no heater, the engine’s in the back so you don’t even get any engine heat. 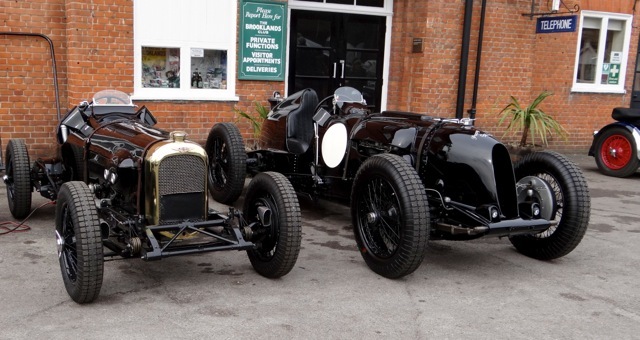 A couple of lovely Bentleys – a unique R type fastback special and a 1930 4 1/2. 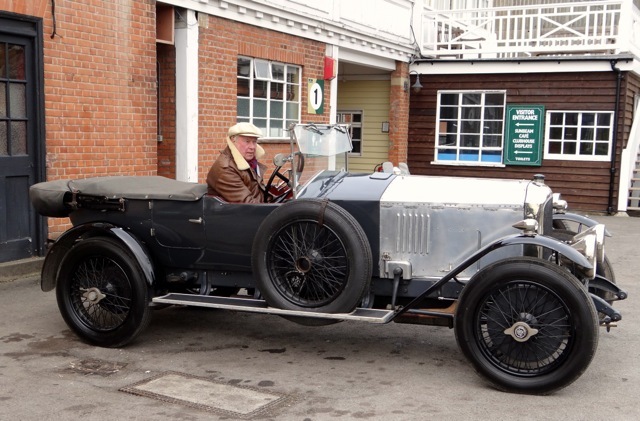 This row were used for journalists to play at being a concours judge – they were given tips for what to look for. 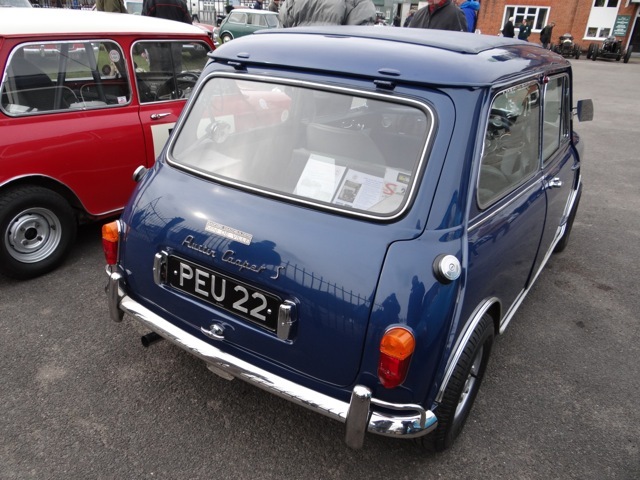 The Mini Cooper S won, it was immaculate but has only driven 150 miles since it’s restoration. 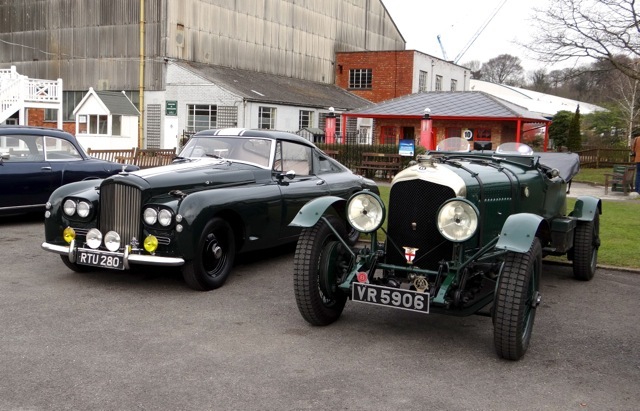 A beautiful Aston Martin and our friends Vauxhall 30/98, both marques are celebrating centenaries this year and will be represented at the Double Twelve. 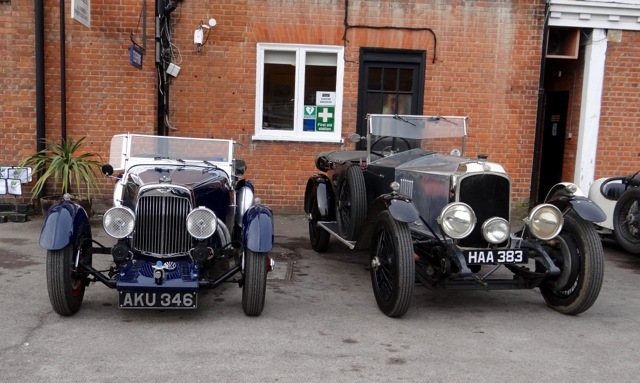 A Lagonda and the Bentley Pacey Hassan Special which has just returned to the UK and will be competing in the Double Twelve event. 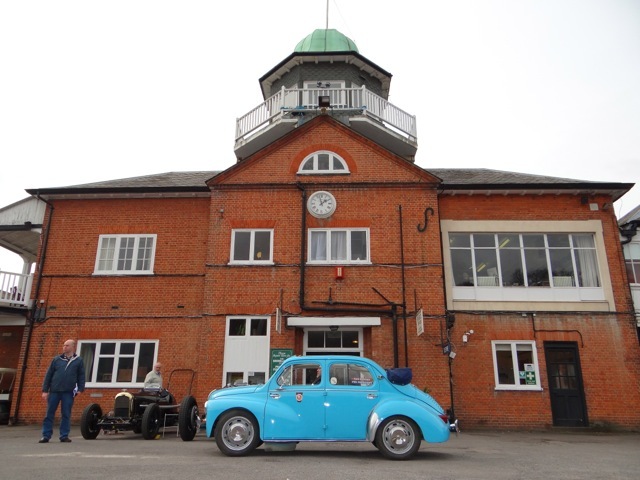 Two AC’s, Brooklands is home to AC Heritage and the original AC’s were built locally and raced at the circuit. 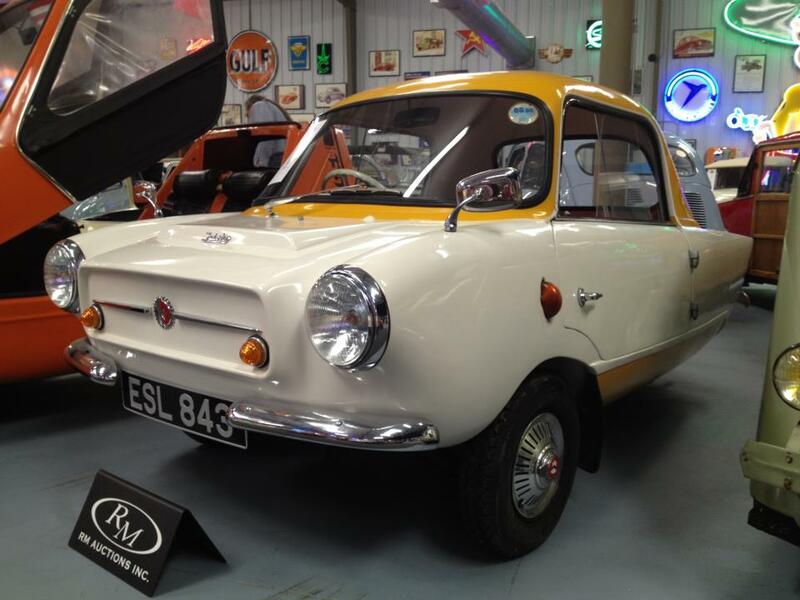 A special Mini de Ville, this period mod was done by Radford and was a very rare ‘hatchback’ version with lots of extras. Mike getting ready for his test on the hill climb. 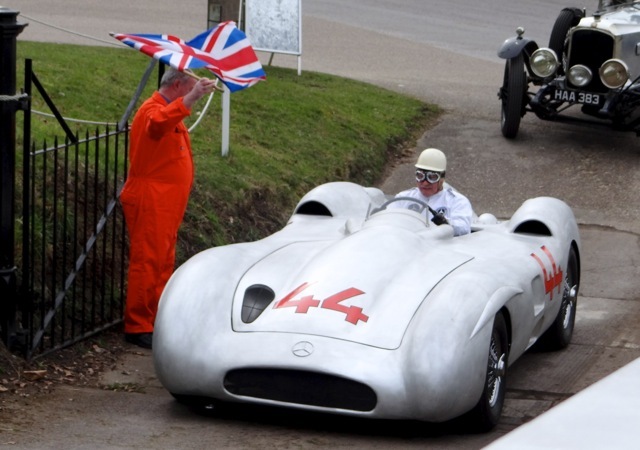 This is a ‘recreation’ of the famous Mercedes 300 SLR as driven by Sir Stirling Moss on the 1955 Mille Miglia and had been built using original Mercedes parts. 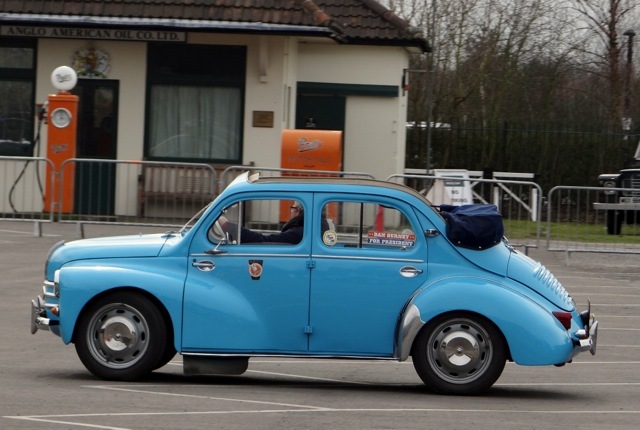 James taking Mario on the second test, a mixture of the speed and agility of the car (very good) and the ability of the driver to remember the route! 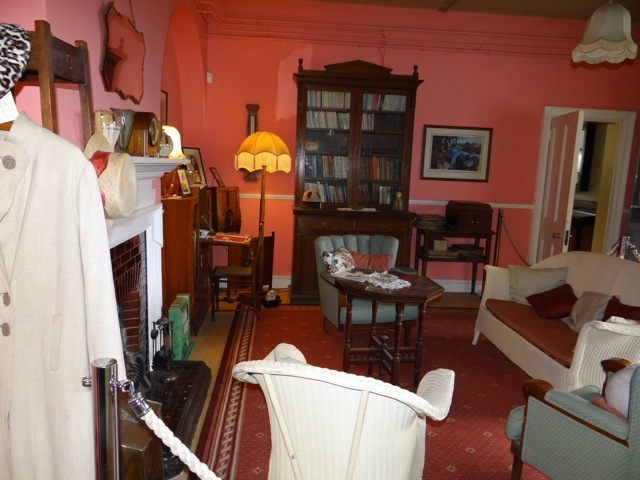 The Barbara Cartland room in the museum. 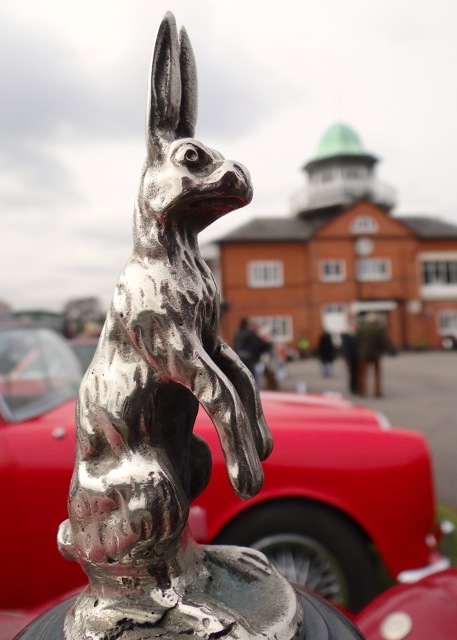 A beautiful Hare mascot on an Alvis. 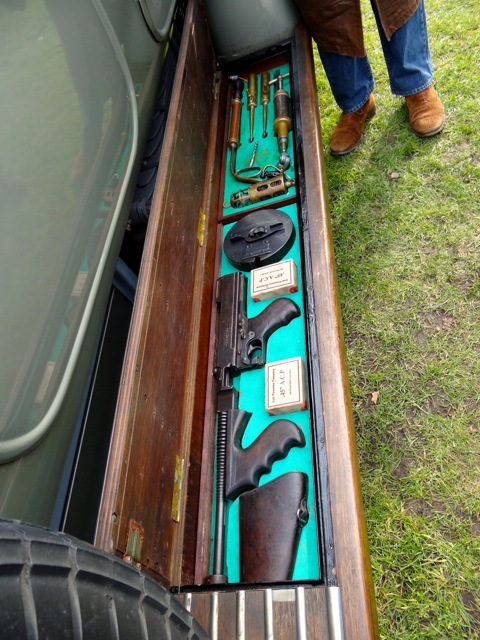 This wonderful 1920’s Rolls Royce had a hidden ‘toy cupboard’ in the running board. All the ‘little’ boys were fascinated and wanted a play. 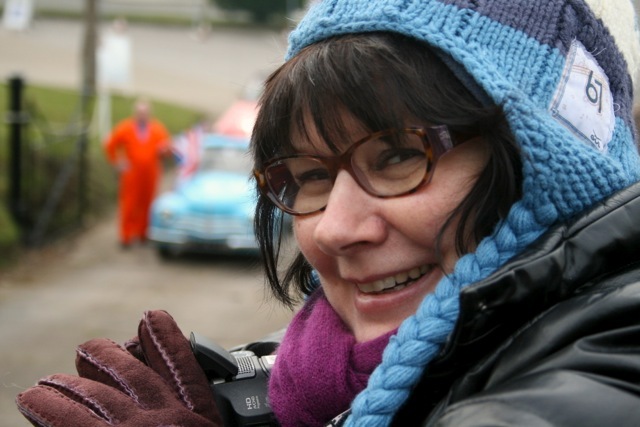 Your author wrapped up against the cold watching James do the Hill Climb test in Regie, picture by our friend Guy Loveridge. Regie outside the clubhouse. 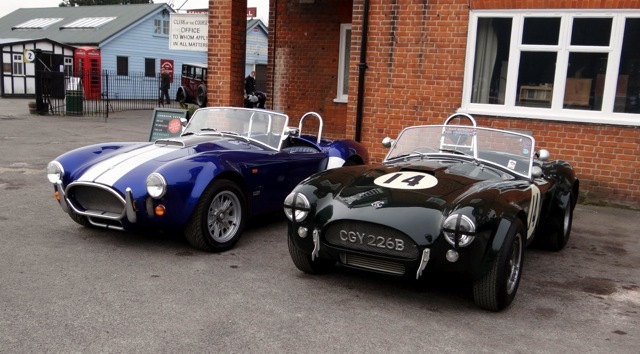 We had a great day and hope we can take some of the cars back to compete in the Double Twelve Event in June, just need to find a class that they are eligible for. 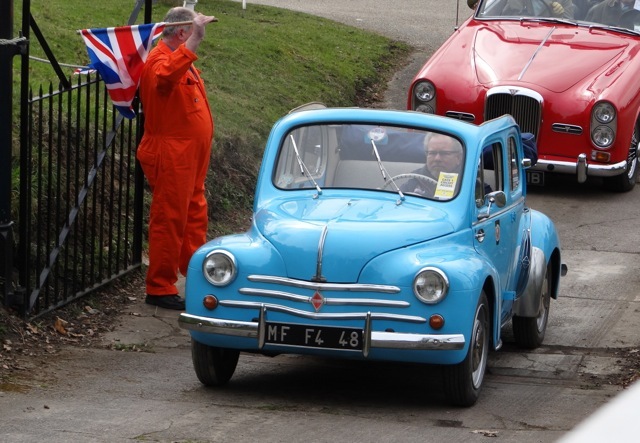 Hopefully Mario isn’t too jealous of Regie’s day out, he’ll get his first outing of the year on Sunday at the first Goodwood Breakfast Club of the year. A few more pics online. 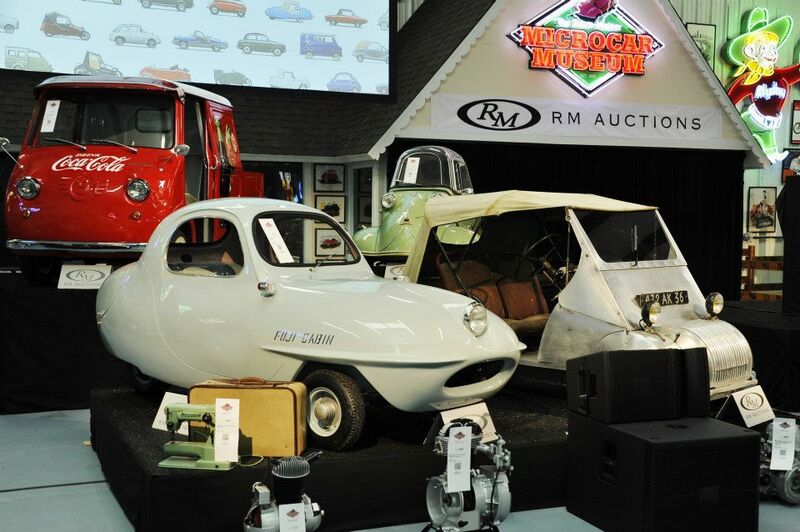 Following our last couple of posts, we watched (online) the RM Auction sale of the Bruce Weiner Microcar car collection with great interest, and boy what a sale, it certainly kept our attention and broke several world records. 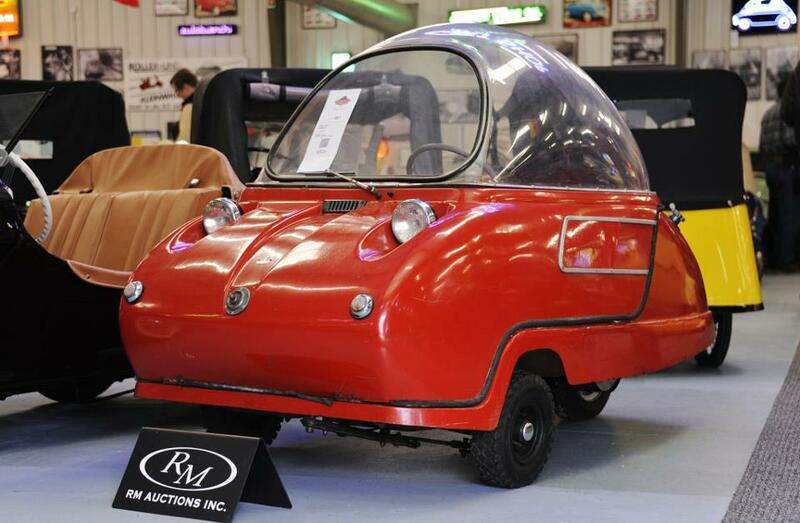 The sale over two days had both memorabilia as well as cars and this saw toy microcars fetching more than we paid for Mario! The sale obviously generated the same ‘mad’ bidding behaviour we witnessed back in London in the 90’s. After the two days of bidding an unusual 100% sale rate was achieved but as no item had a reserve price this was to be expected. 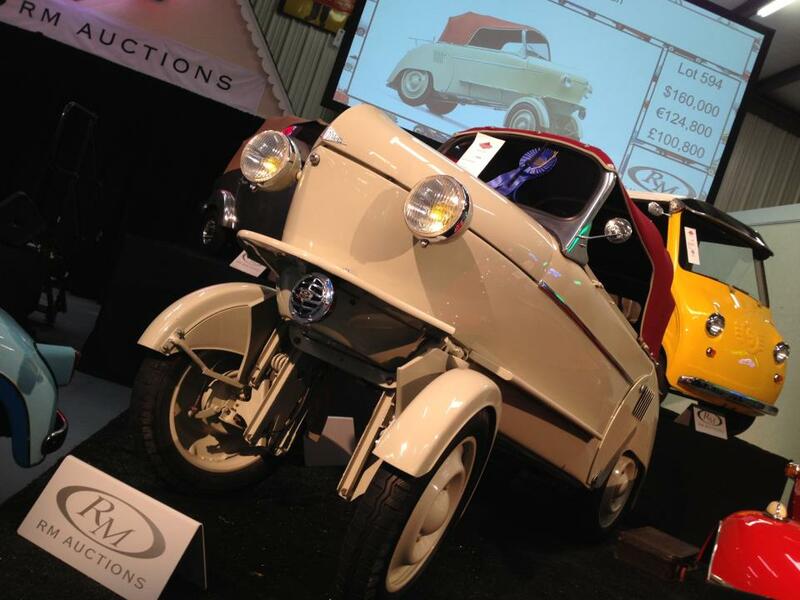 The auction saw $9.1million in sales (30% up on estimate), with many of the car lots achieving over $100k. 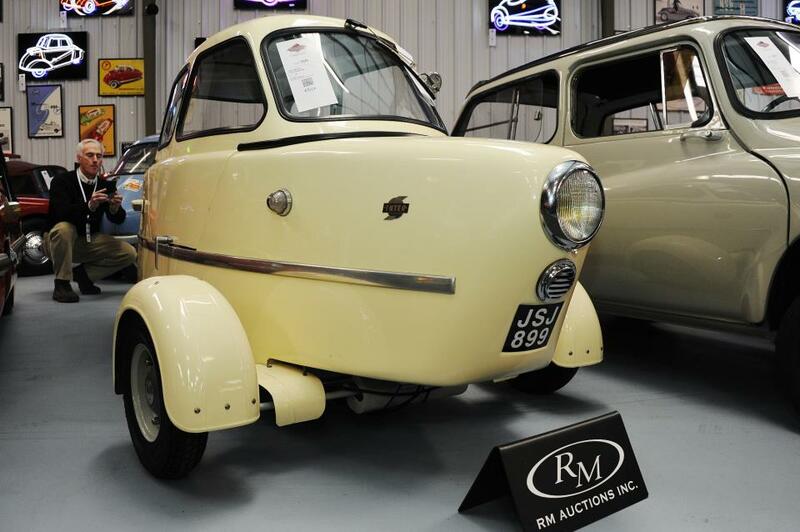 We watched the sale on RM Auctions line feed which held up pretty well and we were very grateful to Microcars online who were at the sale and kept their blog updated throughout the day with the hammer prices of all the lots. RM always have a very ‘full on’ almost theatrical style of auctioneering and you felt the excitement online so it must have been to quote the Americans ‘awesome’ to be there. Max Girardo the auctioneer will need a holiday after this, keeping up his enthusiasm for the 200 plus car lots, he’s certainly good at encouraging people to part with their money. 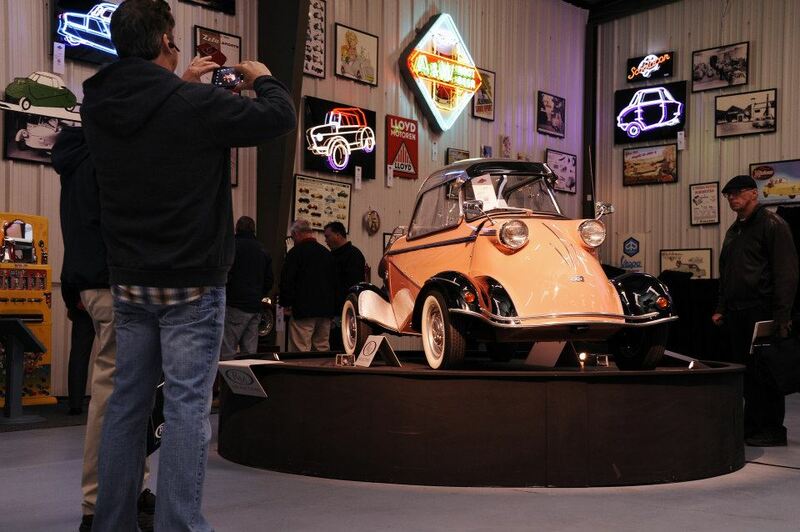 The star lot of the sale was a 1958 FMR (Messerschmitt) Tg 500 Tiger, a microcar with a top speed of a nearly 80mph (although the Subaru 360 beat it on track during the Micro Marathon!). 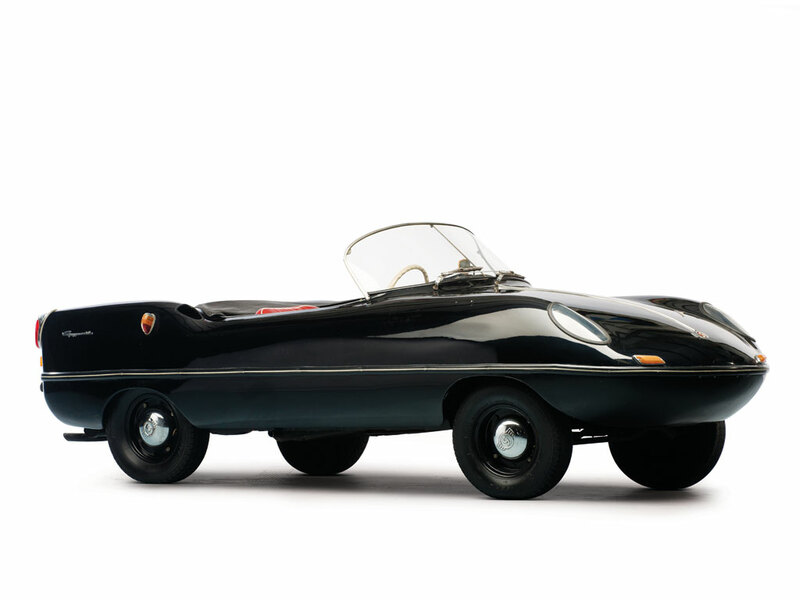 This mini ‘beast’ in a rather fetching rose and black colourway, had an opening bid of $100k and finally went for a staggering $280,000 plus commission. Apparently one guy brought 20 of cars on the first day, he is reported to have recently sold his business and thought he’d start an instant collection. 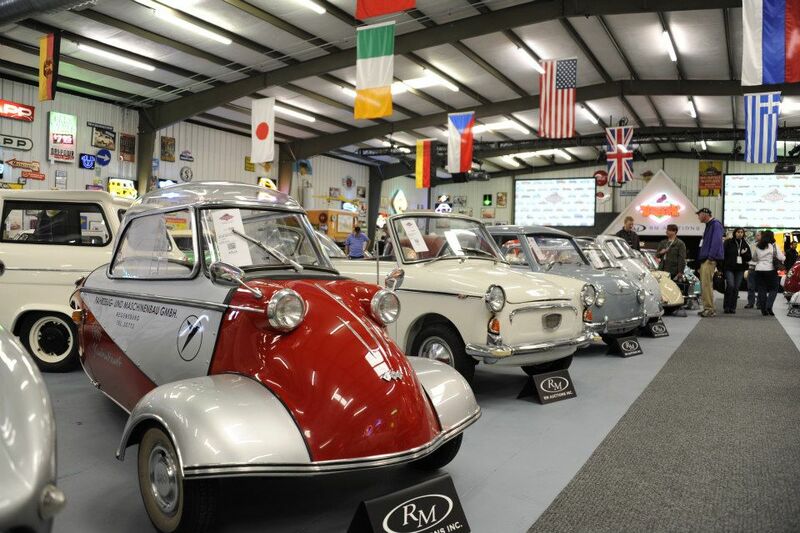 The sales success was put down to being a ‘one type’ auction which meant that collectors from all over the world were at the sale or on the phone bidding against each other, plus RM did a superb marketing job, including this wonderful video building hype in microcar enthusiasts everywhere. 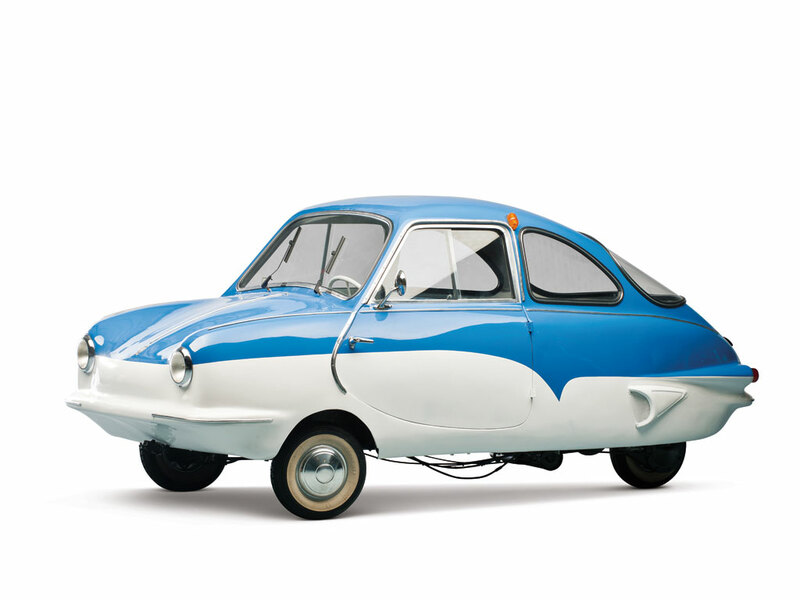 On a personal note the Multipla went for a hammer price of $57,500 which although a lovely example, seems rather inflated, especially as Multipla’s aren’t as rare as many of the unusual prototypes and small production cars in the sale. Although several examples have fetched high values particularly in the US, maybe we need to take a look at Mario’s insurance! 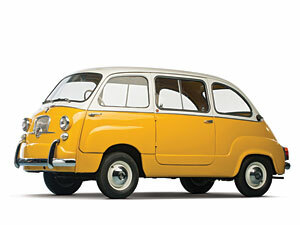 The Subaru 360, a 1970 model fetched $22k so looks like Mario’s ‘brother’ is also increasing in value. 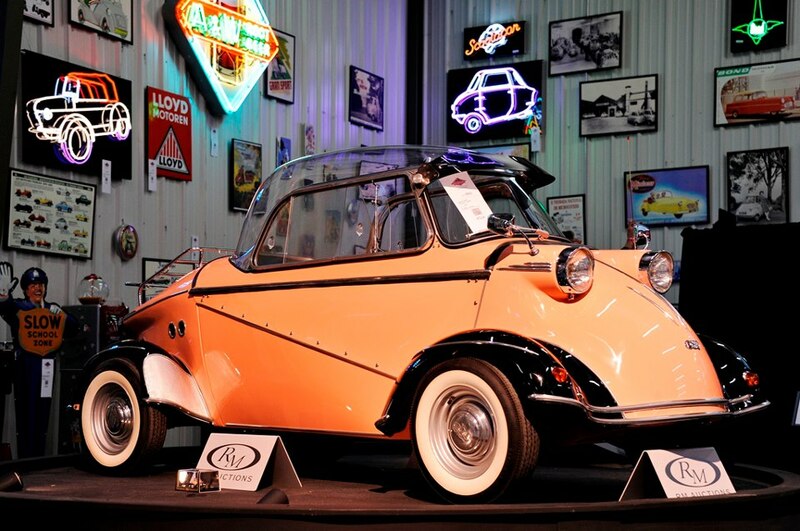 Of the lots we would have liked if we’d won the lottery, as seen in our recent posts, most went in excess of their estimates (we have good taste! 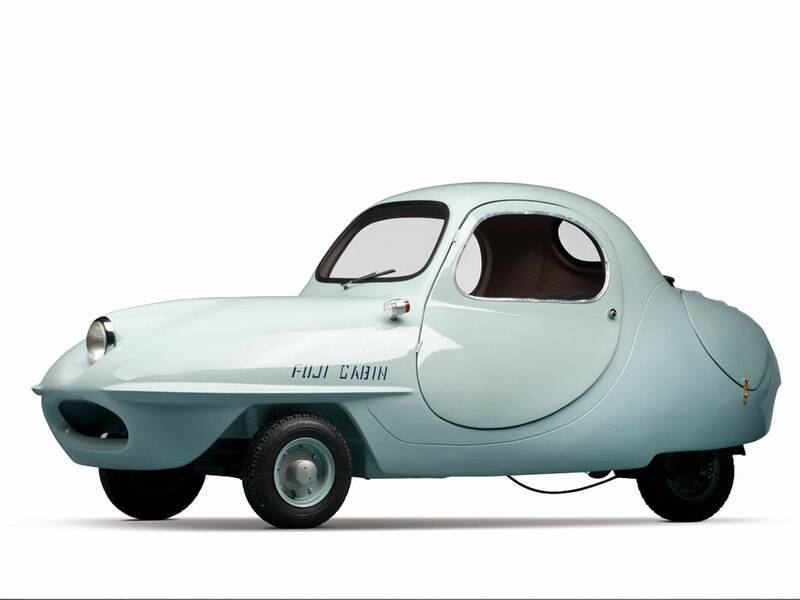 ), hammer price for the Fuji Cabin $110k, Peel Trident $90k, Jurisch Motoplan Prototype $90k, Inter 175A Berline $140k. 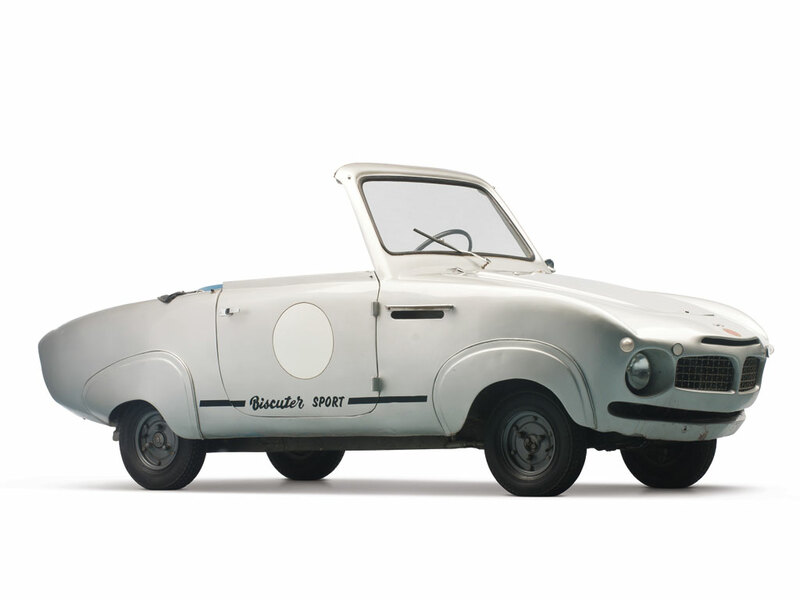 The Frisky Family 3 which had an estimate of $15-20k ended up at $50k but the Mazda R360 Coupe and the Autobianchi Special were within their estimates at $25k and $30k respectively so maybe there’s still hope in increasing our family one day! 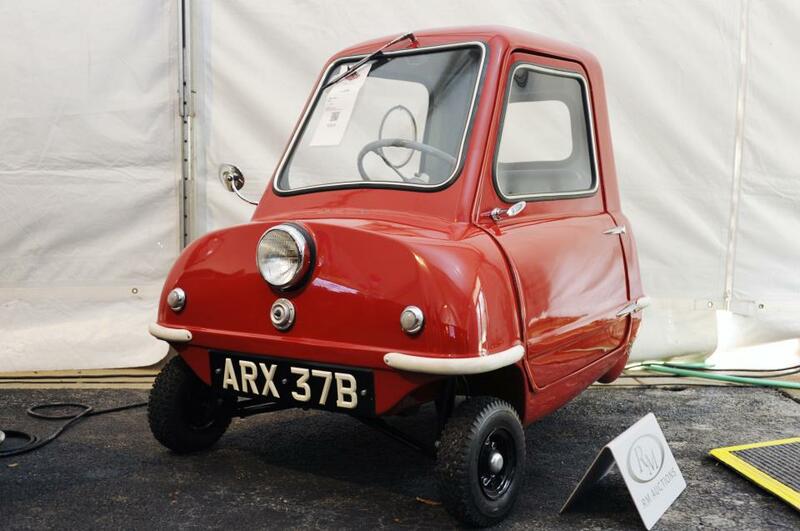 So at the end of the weekend a big result for the tiny cars, we will have to wait to see what effect it has on the ‘normal’ microcar market but whatever happens Mario is still priceless. 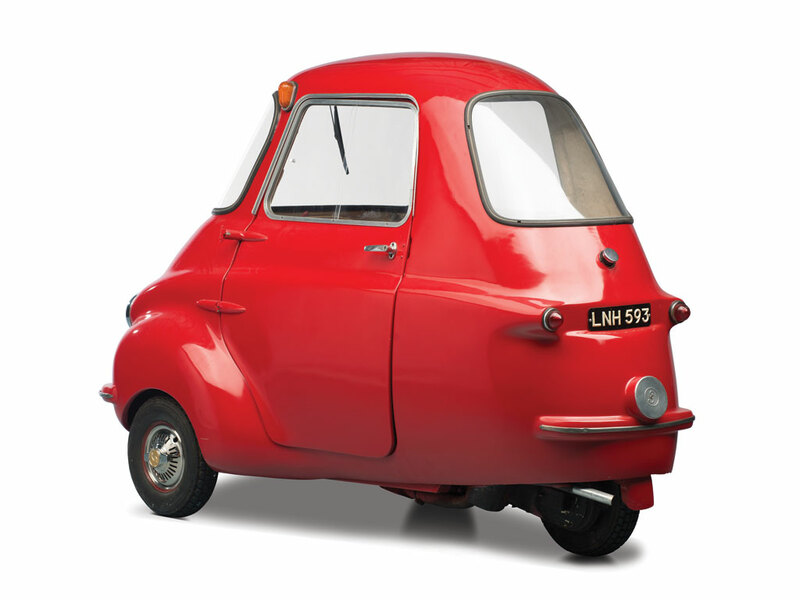 Continuing on from the last blog we’ve had time to peruse the Microcar auction catalogue and discover yet more gems. 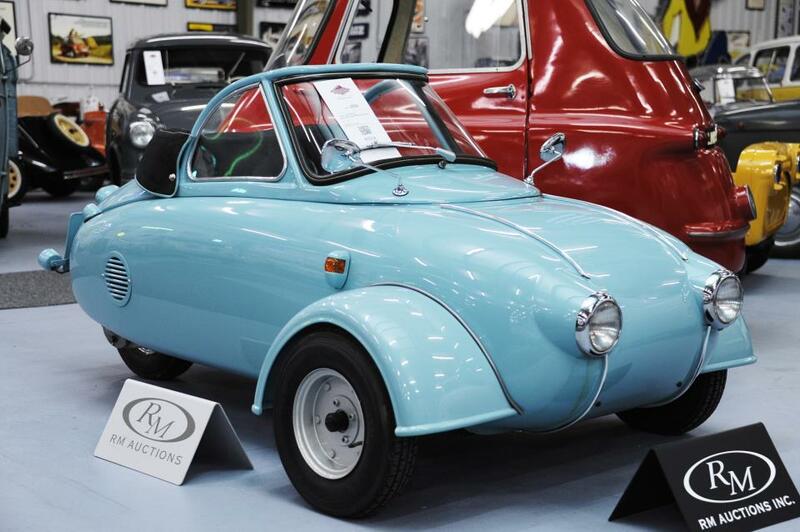 This is a bit of a lazy post but so many of the cars offered for sale are unique and soooo cute we just need to share. 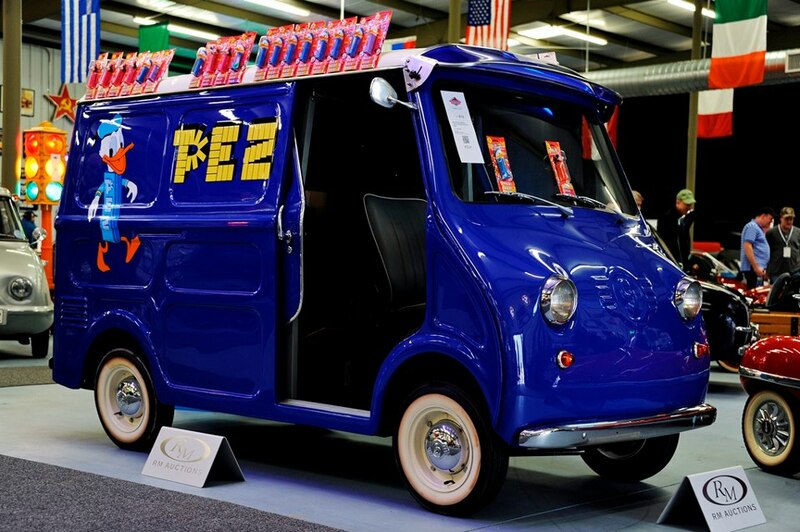 Lets start with this ‘banana’ car, a 1957 Biscuter 200F Pegasin – it just looks bent! 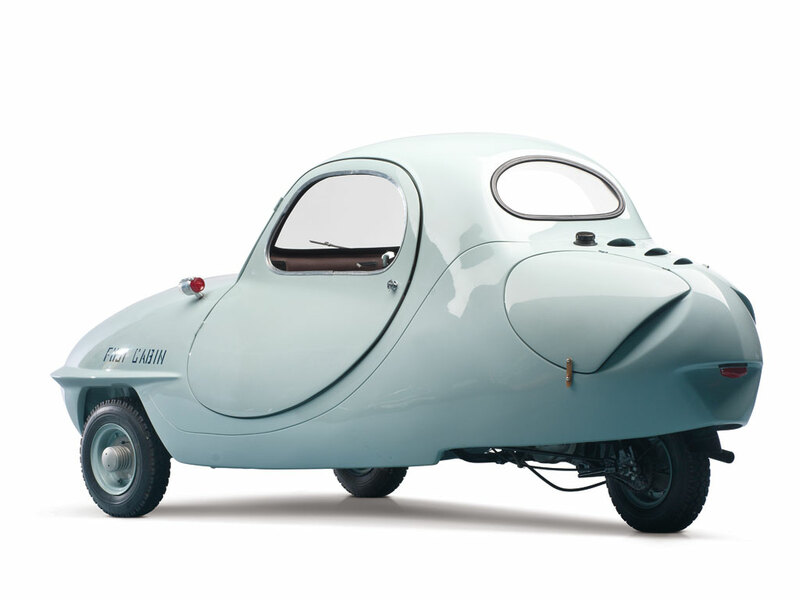 almost like a cartoon car squealing to a halt, maybe the design makes it look like it’s going fast. 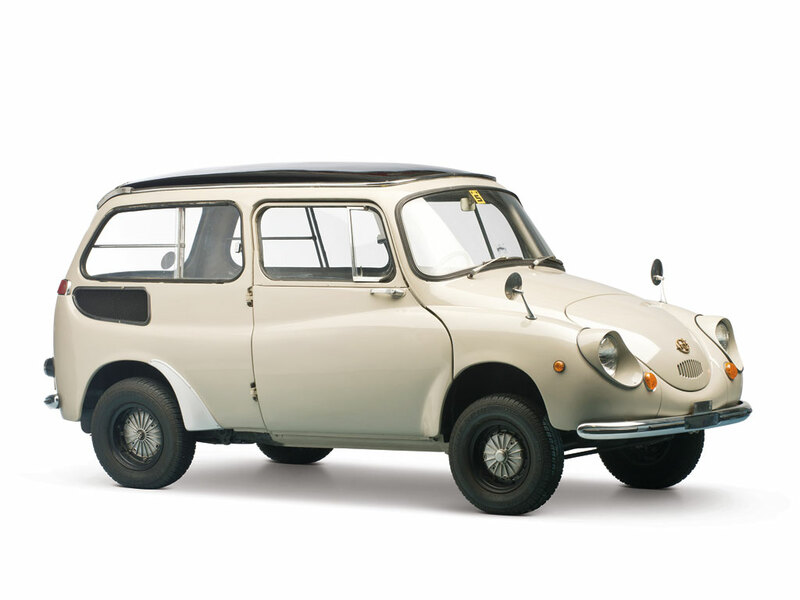 Now here’s one closer to home a custom version of Mario’s little brother Nippy – a 1967 Subaru 360. This estate version looks quite different but I guess it still doesn’t have much extra space inside. 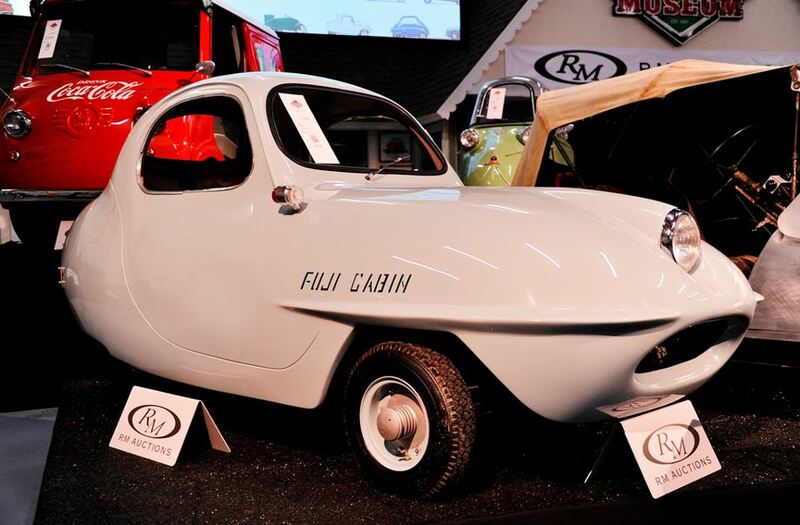 Streamlined and rather mean looking this 1958 Goggomobil Dart is very stylish, one of these competed on the Leige-Brescia-Leige Microcar rally which we took Nippy on in 2008. 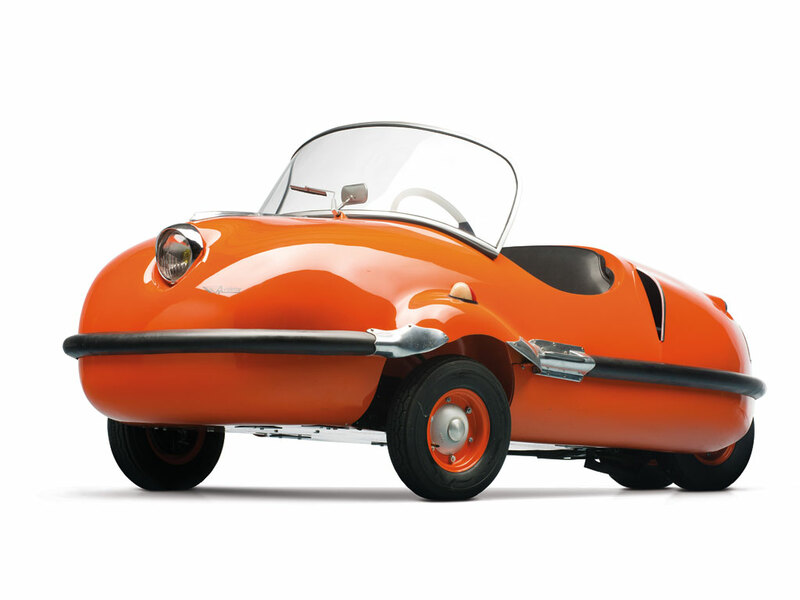 We loved the design then but it was rather unpratical as it has no weather protection and we often saw the car with the driver and navigator huddling under an umbrella.